Pete. Thank you very much. I will spread your information around the class 3 world. (Thats what we call the machine gun and cannon nuts) My gun is number 784. It is a handfull to shoot, it knocks me back about 6 inches when I'm lying behind it. The fellow I bought it from got his first one when he was 12 years old. He used to tow it in a wagon behind his bicycle. He fired some 6,000 rounds through it back when ammo was cheap. Now it costs about $40 per round. We tend to weld one of the gas ports shut so we can use it as a single shot and avoid the brass being damaged when it is ejected. That's probably why it kicks so much. I have a Russian friend I buy night vision gear from. I told him about the Lahti and I teased him that it has pictures of 6 russian tanks and 5 trucks painted on the side. He wasn't impressed. 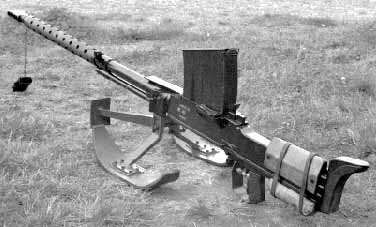 My latest project is a 20mm Hispano Machine gun. I'm looking for a 60 round drum mag for one. With your permission, I would like to post your letter on some of the MG boards. It has some great historical info. Comments: When AIMO J. LAHTI designed L-39, some authorities of the martial medicine warned that "this horrible shoulder-fired artillery piece shall kill it's shooter by the recoil with it's very first shot". It was, of course, the Grey Theory. The autoloading action of L-39 removed ca. 25 % from the felt recoil of that rifle and the muzzle brake eliminated 44 % from the remaining recoil. Brother of the designer, Aarno Lahti, test-shot the very first prototype rifle. He shot two magazines full of anti-aircraft cannon cartridges without a sign of approaching death, asking for some more cartridges, but they were no more available for that first shooting session. It is still one more trick for reduction of "Elephant Gun's" felt recoil: Do not squeeze the "horror handle" of a pistol grip while you pull the trigger. Let the action to stay open until the rifle is returned to it's position after the shot. After ca. one second, let the action to go forwards, without yet pulling the trigger. The felt recoil shall become divided in two rather mild separate pushes. If the gas port is welded-up, this trick cannot work, and you must suffer from 25 % more recoil than the shooter of autoloading L-39. It hurts, but is not yet able to kill. Removing of the muzzle brake may lead to more severe consequences, but the recoil of sawed-off L-39 is again tolerable. Noise of the report is horrible, of course, but considerable reduction of the muzzle velocity is able to reduce the recoil, accordingly. Of course you can use the information of my letter. Permission granted! There is one place in it, written too much hurrying: In the early 1960s were Finns ENDING (not STARTING) trials with full-auto anti-aircraft versions of L-39. Those trials were ended "officially" as early as in 1953, but continued furtively. Rifles were declared obsolete not until the late 1980s in Finland. Selective fire trigger mechanism might be designed along with the rifle itself, but adopted not until needed. Thanks Pete. I have a case of Russian ammo, stamped "188" and "83" on the bottom of the case. I believe, that is factory nr. (?) and year of manufacture. It is the pointed, hollow base bullet, 147 grains in weight. I have decided to just use the Russian ammo as it is (no fooling around), and buy 100 rounds of Sellier & Bellot to fire and use for reloading following the directions in a reloading manual. Better safe than sorry ! I will probably try some of your "cat's sneeze" loads. Very much enjoy the Finnish history you write about. Take care ! 1) ½-charge loads with ca. 10 grains of revolver powder. Muzzle velocity ca. 1480 fps. Blackened brass case. Headstamp may be British or American, of World War I era (1916 or 17). Cartridges were used in the rifles with the earliest S-40 silencers, but they were loaded presumably in 1939 and 1940. Finnish copy of them was VPT A0230, loaded in 1942. Blue case-neck and bottom. Ballistics like those of a Russian cartridge: Too high muzzle velocity.! The suppressor was useless. 2) Partizan cartridges pre-1941 with 0.50 gram of Sokol powder (or it's predecessor), id est 7.7 grains. Nominal muzzle velocity 860 fps. Subsonic; better for suppressed rifles than supersonic "black cartridge". Brass or copper-plated steel case with green code color: 1/3 of case length and the bullet were lacquered green, but sometimes entire length of the case was lacquered green and the bullet was not color-coded at all. These cartridges were and they are extremely rare items, met in museums only. Russian swindlers are trying to sell the common T-30 tracer cartridges as "partizanniy patronniy" to the western collectors, but it is easy to identify the tracer cartridge: It's powder charge fills the case. It does not tinkle in the cartridge. Charge of the partizan cartridge fills about one third of powder space. Faked "partizan cartridges" may be, however, reloaded with the reduced charge afterwards. 3) Partizan cartridges post-1941. Similar to pre-41 loads but with color code: Green bullet tip (of a length just .2 inch) and primer annulus. These factory-loadad cartridges were presumably never actually issued to the partizans. Not loaded in quantity. Ultra-rare items ! Never seen today outside the museums. Once again: Beware of the fakes & "fakirs" ! (This is an additional knowledge to "ARCANE" series. Source of information: Philippe Regenstreif; France. Black cartridges are, however, met in Finland only !). Non-Finnish web-visitors tends to use the term "Cat's Sneeze" for any & all reduced charge loads. It is needed to define the nomenclature still once again: "Cat's sneeze" is loaded with a bore-sized or slightly smaller spherical lead bullet (usually a buckshot), propelled with a primer only or with a booster charge of quickly burning powder. The bullet is centred in the case mouth with some kind of lubricant. In Finland is the bovine shortening (neat's fat) the most popular low-velocity bullet lube. Why pay dear, when you can get the functioning stuff at 1/50 price per weight ? Gallery Load is loaded with a spherical lead bullet and a booster charge of "rapid" powder. 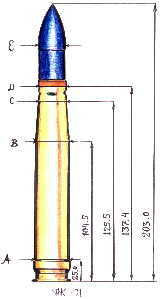 Bullet diameter is groove-sized or still bigger. Cast or factory-made bullet for .31 caliber percussion revolver is good for 7.62 mm Mosin rifle and most of .30 (.308) caliber rifles too... (Experience since 1980). The Spanish buckshots, available in Finland, have variable diameter, according to our new gunwriter Markus (age just 15 years, but his scrupulousness is much better than the conscientiousness of some dilettante engineer-graduate contributors to printed magazines, at the age of 60 + years.!). Markus has sorted out the buckshots, with nominal diameter 7.65 mm, to two main size groups: Those for "cat's sneezes" and the bigger balls for the "gallery cartridges". He has designed a very clever gallery cartridge loading method for .308 Winc. ammo with the buckshots of actual diameter .305" to .307", by the use of 1/4 strip of double thickness toilet tissue as an over-powder wad rammed tightly on the 3.9 grains charge of N 310 and another 1/4 strip as a fluffy wadding just behind the case neck. Cases are resized without neck expanding. Bullets are flush-seated and some melted neat's fat (a bovine shortening) is dropped on them. Accuracy of these loads is much better than that of a .22 LR rifle, loaded with some cheap bargain-sale cartridges; five shots groups in less than an inch to 25 meters, and the report noise is very low; "silent without a suppressor or silencer". All of those buckshots used are too small for the real Gallery Loads, but those two waddings, slamming together and then on the soft lead bullet, shall expand the spherical lead bullet to become groove-sized. For the 7.62 mm Mosin Gallery Cartridge is a .31 caliber percussion revolver bullet excellent, loaded with four grains charge of rapid powder (VihtaVuori N 310 or Hodgdon Universal) and a ½ strip of toilet tissue wadding rammed over the powder; the bullet seated flush with the mouth of an un-resized case, previously shot in your rifle and some kind of lubricant dropped on the bullet. Other type of 7.62 mm reduced charge loads is the Hunting Load (for small game) with a short bullet, weight no more than five grams/ 77 grains. A bullet of .32 A.C.P. is suitable, but the load must be supersonic, because there are jacketed bullets with a diameter .315" no more/ not yet available. Minimum powder charge with a jacketed bullet is 1/10 bullet weight of N 310 or Universal powder. Usual charge with Lapua .32 ACP 75 gr. FMJ-RN bullet was a 9 mm Luger case full of powder N 310, or 8.5 grains; somewhat cracky load, but a skilled marksman could take a bull-moose with it. Production of these bullets is recently discontinued, of course... (It was among the most horrible DumDums when the striking velocity was 2600 fps + ). A nice Partizan Cartridge you may load with 110 grains Sierra FMJ-RN (M1 Carbine standard bullet) and the same 8.5 grains of N 310 powder. This combination is usually subsonic in original Mosin-Nagant M/1891 rifles, but the charge may be reduced to 6.2 grains if necessary. Further reduction is unadvisable! There are not reloading manuals for the reduced charge loads available at all. Don't waste your time for finding one. This kind of data is available from our "G.O.W." web sites only! Hodgdon Powder Co. Inc. may try to break our monopoly, but they are almost 20 years behindhand with my work. Finnish Vihtavuori has given up fifteen years ago. Hi I enjoyed looking at the pictures in your Lahti article. I have an L-39 Lahti 20mm rifle and I enjoy it a lot. I was wondering if you have ever written the same article in English? By the way, I see in the picture, an unusual aircraft sight on the rifle. Is this your rifle? Did you mount the sight yourself or was that a standard variation for it? Is that pedestal mount standard? That Lahti article on the Finnish questions & answers column was not an article but a collection of old surplus drawings (see dates of the signatures) with somewhat expanded captions. The whole story re special cartridges of Lahti anti-tank rifle was published in an abortive Finnish magazine "Asemaailma" ("Weaponry World"). I found that odds & ends material by a lucky accident from my home archives. Now I am seeking that issue of Asemaailma, containing that story and other drawings & photographs with an intention to translate it into English - if I shall get some time for this project. This a-t rifle on the photographs is property of a Finnish gun collector. It is de-activated. All the equipments are of original issue and standard. All the fuzes were made in Finland but those Duplex boosters were swapped with Suomi submachine guns from Germany. Duplex booster was needed to shatter the phosphorus-filled shell and splash the burning phosphorus all over. Those improved fuzes were ultra-sensitive. Use of them was prohibited in rainy days, because the raindrops could cause prematures... Otherwise was the TIKKA Ti 15/18 fuze safe to use, handle and transport but still among the most reliably functioning fuzes for the 20 mm shells during II World War: The best one. That blue projectile was a solid shot of hardened steel, able to penetrate obsolescent Russian tank's or armored car's side or back armor plates. Even the heavy main battle-tanks T-34 and Klim Voroshilov were possible to immobilize with ten shots on the track link, or the turret was "riveted" with these blue bullets aimed into the seam between tank hull and turret. Some extra "rivets" could prevent elevation of the turret cannon.When the Russian tank crew tried to traverse that riveted turret, some brave Finnish warrior slipped ten or twelve pounds charge of T.N.T. below the tank's belly and pulled the string of 5½ seconds time fuze. The dose was sufficient to kill the crew, but the tank was many times repaired for use of Finns. Russian IL-2 land-strafing aeroplanes were heavily armored "flying tanks", impossible to destruct with usual infantry firearms and too swift to get down with anti-aircraft artillery. An anti-tank rifle, mounted with a "Christmas tree fastening" on the tree stump 5½ feet high was flexible enough for dropping of these "Stormovik" planes. It was usual trick to remove the sear of L-39 and use the handle of action hold-open lever as a trigger. The rifle shot full-auto fire, when the sear was removed, with a cyclic rate ca. 400 rounds per minute. If the incendiary shells with a tracer were available, they were loaded into the magazine alternately with blue AP bullets, but the penetrating bullets only could also destruct the Flying Tank. Pilots of these planes were foolhardy kids from Comsomol; not the experienced fighter pilots needed for the dogfights against Germans in the cockpits of "Shylock's presents", Airacobra and Mustang fighter planes - donated by U.S. Government to Stalin. Excessive trust in armor plating of Stormovik planes was fatal to many pilots. Sometimes was the shooting range about similar to that of duck-hunting with a shotgun. Many times the pilot was killed in action with a direct hit through the cockpit. 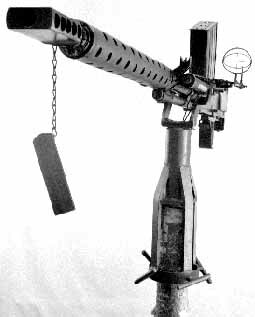 Evolution of the Norsupyssy ("Elephant Gun" in Finnish) was continued still after the WW II, presumably until early sixties, because a tree-mounted 20 x 138 mm gun, able to shoot burst fire, was considered to be an ideal weapon against helicopters. Last guns produced were equipped with a fire selector. Full-auto shooting was, however, too stressing. Receivers of these anti-helicopter guns disintegrated, when the riveted construction failed, and there was not enough grants made for re-design of receiver to become burst-fire proof. These three Finnish rounds of ammo were designed especially for L-39 rifles. (A fact unknown abroad and less-known in Finland too). All kinds of 20 x 138 mm Solothurn Long cartridges were possible to shoot from "Elephant Gun", but with somewhat less accuracy. German, Italian and Swiss ammo were imported plentily during 1941 - 44 war. Those devices seems to be similar. What makes the firearms to become "silent" like in the movies or TV spy and crime series ? Why the "suppressors" despite of more diameter and length of them are less efficient devices ? Silencer and suppressor are alternative names of the very same device. Third name is a "sound moderator", coined by a British manufacture Parker-Hale for goofing of U.S. customs officials after the validation of Lex Morgenthau in 1934. "Moderators" for .22 rimfire arms were declared as the "parts of wireless receivers" as late as in the early 1970s, until an author of the book "SURVIVAL POACHING", known by a pseudonym "Ragnar Benson", exposed that trick. Silencer is a somewhat misleading name, coined by HIRAM PERCY MAXIM in 1908. It is impossible to design truly silent weapon, throwing some kind of efficient projectiles. There is a sound "PHOOD" audible even when one is using a blowpipe and a twang of the string when the bow and arrow are used. Snap of the crossbow string may be more noisy than is the mild report of a 7.62 mm Russian military rifle, shot with a Finnish low pressure cartridge m/-36 or Russian Ohotnichye Patron. A gunshot may, however, become (almost) silenced or just suppressed. The same device may be a "silencer" or a suppressor, if it is long and fat enough - and designed to stand the muzzle blast of full-power loads. It is possible to suppress the signatures of shooting - the muzzle blast and flash along with the recoil - efficiently by the use of a well-designed device, but it is impossible to suppress the blast of an usual revolver (leaking the powder gas through the gap between it's barrel and cylinder) or the mechanical noise of any selfloading or full-automatic firearms, and that "whiplash noise" of a bullet flying silently through the roaring air, just like a jet aircraft at the supersonic velocity. The flight noise of a bullet is easier to evade than death or taxes - by use of the cartridges with a subsonic bullet speed. These special rounds are available also for some rifles, but the handloading is the most usual way to get them. Some handgun cartridges, like .45 A.C.P. (with usual bullet weight) are inherently subsonics. If the velocity reading is written or printed with three digits (up to 999 feet per second), the bullet velocity is subsonic in all those atmospheric conditions comfortable enough for outdoor activities. The former suppressor shall become a "silencer" when the bullet velocity is reduced to the subsonic level. Some shooting signatures are impossible to avoid: The "gap blast" of the revolver (save the rare curios like Russian Nagant R 1895 and some other still more rare gas-sealed wheelguns like Belgian Pieper), or the mechanical noise of autoloading actions. Even the hit on the target shall cause the noise, if all the other shooting signatures are eliminated by some means - an impossible mission as it is. I don't know, how the sound-track recording engineers of Hollywood or TV studios are made that synthetic "TSYOUP, TSYOUP" sound of the silenced firearms (including revolvers !) but I think, they have never listened the actual reports of silenced or suppressed firearms - and the thuds of the bullets, hitting on the living tissue; flesh and bone. For those Americans going to handloading of the subsonic rifle cartridges may be interesting the website addresses of my good friend MIKE DALY of HODGDON POWDER Co. Inc: <hpchelp@swbell.net> or <help@hodgdon.com>. Telephone 913-362-9455, FAX 913-362-1307, postal address 6231 Robinson Shawnee Mission, KS 66202. Australian manufacturer of Hodgdon "Universal" powder has also confirmed these good news that a world-wide distributor of it handles all of the reloading enquiries. Enjoyed reading your answers. Maybe you can help me ? I have a Finnish Mosin (M39) and would like to load some reduced loads (but not subsonics), with ballistics similar to 30-30 or 7.62 x 39. 1) I have some surplus Russian 7.62 x 54R with 48.3 grains of extruded powder, 147 grain FMJ bullet, and was thinking to pull the bullets, and load some starting at 41 grains, then 42, then 43, and finally a couple rounds at 44 grains. Would charges such as this be dangerous for detonation / S.E.E. ? 2) I have some Hodgdon H-380. Would this be better, and how much of a charge would give muzzle velocity of approximately 2300 feet per second (about 700 meters per second). 1) Rule number one: "Never use unknown powder for reloads !". Rule number two: "Never use the rifle powder for reduced charge rifle loads - unless it is one of the most rapidly burning propellant already classified as rifle powder; practicable for the Magnum revolver cartridges too!". Extruded Russian powder may or may not be somewhat flexible, but are your cartridges loaded during Imperial Russian, Soviet Russian or Free Russian era ? (Pre-1918 ? Post 1930 to 1945 ? Post-1945 era ?) Headstamp of case tells the vintage. Is the bullet pointed flat (hollow) based "Lyohkaya Pulya of year's 1908 pattern ?" or a boat-tailed post-WW II "Lyohkaya Pulya s Serdche ?" (= light bullet with iron core; since 1983 with a hardened steel core, color coded with silver-looking tip painted with aluminium lacquer). There are too many unknown properties of cartridges and bullets for developement of a reduced charge even with a fresh and known powders. Suitable propellants are: Vihtavuori N 110, IMR or Hodgdon 4227 and SR 4759 (last mentioned is especially made for reduced charges, somewhat more powerful than subsonic ones. It was once declared as "obsolete propellant" but returned to the production because of demand). Without knowledge on the age and condition of the cases and the bullet design it is too risky to quess the powder charges for the handloads. Charge less than 45 grains may develope S.E.E. if the primer is faulty. 2) H 380 shall give the 2600 fps muzzle velocity with the listed minimum charge 50 grains. Suggested charge is ca. 53 grains, giving about 2700 fps velocity. It is, however, advisable to shoot these surplus cartridges with their original charges, if the powder is undeteriorated (not stinking acrid, clumped or looking "rusty"). Most Russian rifle powders are almost everlasting, if they are not moistened or made during the "hard times" (with headstamps 41 to 45 at "six o'clock" position on the case heads), but the primers may be inert or give hang-fires. Russian pointed L-bullets are unable to give a good or even fair accuracy in any rifles because they are too thin (with .307" / 7.80 mm diameter) even for the .308 caliber bores. Finnish "Ukko-Pekka" M-39 rifle has chamber and bore dimensions about similar to the original MOSIN-NAGANT M/1891. Russian LPS boat tail bullets gave also just a fair accuracy, but since 1983 they became greatly improved by adoptment of a lathe-turned steel core instead of chopped and swaged iron core. Sorry, I am unable to give more exact loading data, because of insufficient (= non-existent) information re your cartridges. 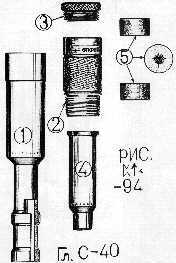 What are those numbered parts of exploded drawing of the Glushityelj suppressor described in Arcane 3 story of Gunwriters and in one of your Kicback answers below? What do the Russian letters mean? 1: Suppressor jacket with integral bayonet mounting sleeve. This rough drawing is lacking a "tablicha" = table of the sight adjustment and a warning: "Use with black (or green ?) cartridges only. Do not shoot fighting ammunition", engraved or stamped on the jacket. 2: Intermediate chamber with left-hand threads (male and female). Text: "OTKROY" = "twist open". 4: Distance piece. The rebated "neck" was pressed on the rifle muzzle when the flange compressed the rearmost rubber wipe. 5: Rubber wipes or "shoot-through baffles". There were two of them in S-40 suppressor and three wipes in a rare S-43 variation along with an extra intermediate chamber. This third wipe destructed usually the shooting accuracy, and in 1943 even those S-40 suppressors were found to be meaningless devices. 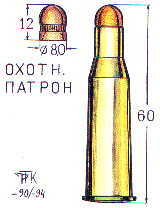 7.62 mm Partizan cartridges were as "silent" or noisy with or without the "glushityel". Thickness of these wipes was originally 25 millimeters but it was later reduced to 15 mm. 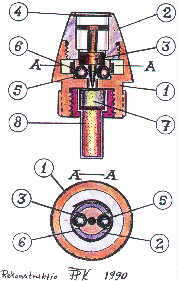 The rearmost wipe was also a mounting spring of the suppressor. Lower text is a Russian abbreviation: "Gl. S-40", presumably derivation from words: "Glushityel Sestoryechskogo-Sorok" = "suppressor of Systerback (arms manufacture) - model Fourty". Upper legend is: "Ris." (= "risunok" = "drawn by") and "PT -94" as the signature. Text: "PT" is not of Russian but old Scandinavian rune letters. Nota bene: Rune alphabets on the WEBSTER's Dictionary are of German/Gothic type. There were at least eight more or less different elements of rune.